This Primer addresses the role that information and communication technology (ICT) can play in enhancing the ability and capacity of humans to deal with the impact of climate change and contribute to sustainable development. This Primer addresses the role that information and communication technology (ICT) can play in enhancing the ability and capacity of humans to deal with the impact of climate change and contribute to sustainable development. The principle of sustainable development is an important guide to ensure that the use of ICT to tackle climate change effects is done in a way that does not impact on the ability of future generations to meet their own needs. There are two main policy responses to climate change: mitigation and adaptation. Mitigation addresses the root causes, by reducing greenhouse gas emissions, while adaptation seeks to lower the risks posed by the consequences of climatic change. Both approaches will be necessary, because even if emissions are dramatically decreased in the next decade, adaptation will still be needed to deal with the global changes that have already been set in motion. Note that climate change mitigation is not the same as disaster mitigation. Climate change mitigation includes actions to reduce greenhouse gas emissions. Disaster risk mitigation is the lessening or limitation of the impact of hazards such as floods and earthquakes. It includes the implementation of structural measures (e.g. flood gates) and non-structural measures (e.g. land-use planning) so that when a disaster strikes, its impact on communities is lessened. 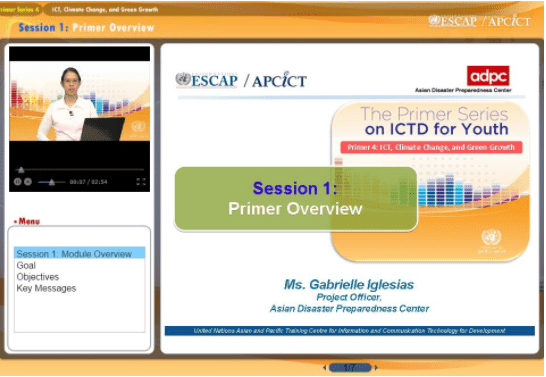 This Primer focuses on the role that ICT can play in climate change adaptation and mitigation. Since climate and the environment are linked, this Primer also considers the role of ICT in helping humans understand the environment that surrounds them, which is a prerequisite for tackling the problems of climate change. While the Primer also considers the role of ICT in and disaster risk management (DRM), it does so in regards to some new ICT-based applications that are not covered in Primer 3, which provides a comprehensive overview of the role of ICT in DRM. Provide a Green Growth-oriented approach to development, and discuss the role of the ICT sector in promoting Green Growth. Gabrielle Iglesias is a project officer handling capacity building in climate change resilience for the Climate Change and Climate Risk Management department. She is currently involved in supporting early warning systems development projects for the National Hydro-Meteorological Service of Viet Nam, and for relevant organizations in Semarang City. Ms. Iglesias led the projects several knowledge development projects, such as UNAPCICT’s Module 9 (ICT for Disaster Risk Management), Module 10 (ICT, Climate Change and Green Growth) and the corresponding University-level primers. She was a member of the ADB Technical Working Group of the Regional Consortium on Downscaling Climate Futures to Support Adaptation Planning and Practices in the Asia Pacific. Ms. Iglesias joined ADPC in 2006. Before joining, she was Assistant Professor at the University of the Philippines, and was focal point for the development of the Spatial Information Management specialization of the Masters in Public Administration program. She had served as consultant for e-government to the League of Cities of the Philippines Liaison Officers Association, and for Amellar Corporation in the area of GIS Design. She earned the following degrees: (1) a Masters with distinction in Geoinformation Management and Earth Observations from the International Institute for Geo-Information Science and Earth Observation (ITC), specializing in Urban Land Administration (2000); (2) a Masters in Public Administration from UP-NCPAG (1995), specializing in public policy analysis. Copyright 2017-2018 UNESCAP, All rights reserved.